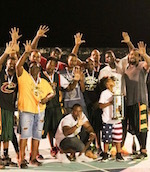 The game between Hoyas (2-2) and Shottaz (3-2) was the most important one in the last round on Sunday night. Hoyas were defeated by Shottaz at home 46-60. Shottaz are looking forward to face Outlaws (#4) in the next round. Hoyas will play against Spartans and it may be a tough game between close rivals. An interesting game for Raiders (4-0) which hosted in Outlaws (2-3). Raiders managed to get a 14-point victory 86-72. Raiders will play against Spartans (#5) in the next round. Outlaws will play against Shottaz and it may be a tough game between close rivals. The game between Shottaz (3-2) and Spartans (0-4) in on Saturday ended with biggest points difference. Shottaz outscored guests from 87-62. Shottaz will meet Outlaws (#4) in the next round. Spartans will play against Raiders and hope to get finally their first victory.